Getting to know my clients a little bit before a session makes real magic happen. When I get an inquiry, before I schedule a session I always get a little bit of the backstory - it helps inform everything! Location, wardrobe, and the directional cues I'll give throughout. When I first talked to Erica, she told me how the two met working at a brewery back in Pennsylvania. It was only fitting then, when I met them for their session and they greeted me with a local beer (Golden Road's hefeweizen). It was a completely genuine, unplanned moment where I got to learn a little more about them firsthand before bringing a camera out. I met one of their cats, talked a little bit about my work, and sipped from the cold can. We finished up and headed to Vasquez Rocks. On the ride to the location, we talked like old friends. We talked about Pennsylvania and the east coast, about the cost of living in LA, about holiday traditions and upcoming trips to see family. We talked about the way everybody in LA- or maybe it's just the transplants - seems to have an adventurous spirit. Josh and Erica love camping, hiking - anything outdoors. The further from cell service, the better! 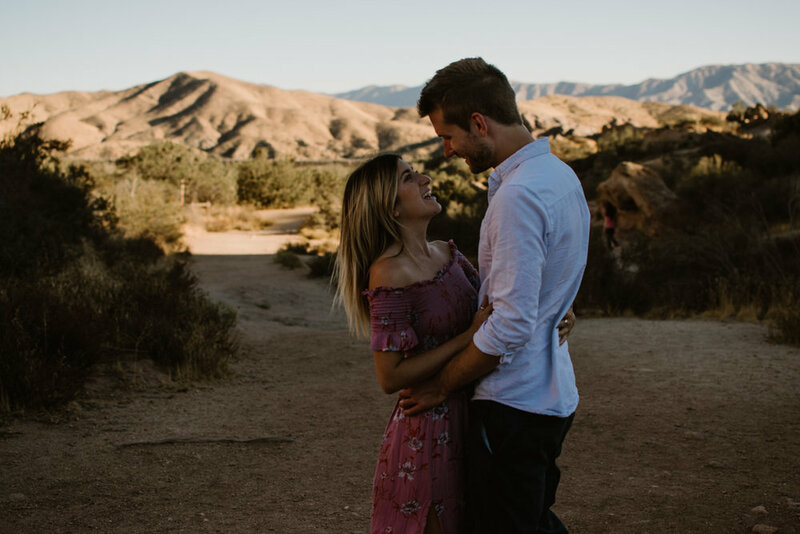 When they suggested Vasquez Rocks, I knew it'd be a perfect fit because they would feel in their element! It was about 94 degrees that day, but by the time we got to Vasquez Rocks the sun had slipped down behind the mountain and it began to cool off. Arriving at Vasquez Rocks, the three of us stood gaping at the landscape before us. We walked in absolute wonder around the jagged features and looked at the blue sky totally mesmerized. We found a few places that I thought would showcase their relationship- and the gorgeous backdrop. While I tested the exposure on my camera, I asked them to walk towards and away from me a few times. This way while I'm getting set up, they're walking off a little of the pre-shoot nerves! As they seemed to grow less and less aware of the camera, I just remember feeling so honored to be able to do the work I love. I work with people from all different backgrounds at many different stages of a relationship, essentially ask them to go on a date and let me take pictures, and then I'm able to deliver a time capsule of this period that they can always look back on. As the sun began to fade, we had to pull ourselves away from Vasquez Rocks. As hard as it was to leave, we knew we were racing the clock for sunset at the beach. We began weaving through the Santa Monica mountainside on our way to El Matador. As we'd round a corner, they'd point out a great winery or cafe. At one particular turn, the sunset took our breath away. We saw a pull off up ahead and before I could even finish asking the question, they said yes. We hopped out of the car, dust still lingering at the tires, and walked the length of this cliffside overlooking the Pacific. We knew we had mere minutes of sunlight left so we ran back to the car + made our way to the parking lot. To reach the beach we had to fight back against the surge of beach-goers heading home for the day. Once we finally reached the shoreline, we were surrounded by half a dozen photographers doing work of their own. Luckily not far away we were able to find a secluded stretch. Josh and Erica slung shoes and bags down onto the beach and walked hand-in-hand to the water. El Matador had an insanely beautiful sunset for us that night and I couldn't have been happier to be experiencing it with two people so obviously head-over-heels for each other.